Cymbalta® or duloxetine is the first drug approved by the FDA for painful diabetic polyneuropathy. 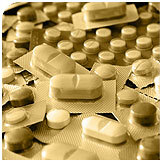 The drug was previously approved as an antidepressant. The drug is an SSNRI meaning it is both a selective serotonin reuptake inhibitor and a selective norepinephrine reuptake inhibitor. By blocking the reuptake of serotonin and norepinephrine, these neurotransmitters increase in the spinal cord and brain. It is speculated that both increased serotonin levels and norepinephrine levels produce an inhibitory effect on the ascending sensory tracts. In the two controlled studies of Cymbalta versus placebo, the Cymbalta patients had their pain reduced on average about 50% compared to their starting point. The dose of 120 mg per day did somewhat better than 60 mg per day but this was not statistically significant. Most of the benefit was seen by the end of the 3rd week. The placebo group's pain reduced by about 30%. This large placebo controlled response is widely seen in trials of diabetic peripheral polyneuropathy. The improvement seen with Cymbalta is both clinically significant and rather impressive when compared to other pain trials. In general, patients consider their pain relief meaningful when their pain is reduced by at least 30%. This reduction was seen in 55-60% of patients. The medication is generally well tolerated. In the controlled trials, the most frequent side effect was nausea. The nausea was generally short lived (6 days was the median, 75% went away within 2 weeks). Nausea was, however, severe enough that a few percent discontinued. In a more recent depression trial, starting at 30 mg once daily for one week before increasing the dose to 60 mg appeared to reduce the incidence of depression and the drop out rate. In my practice, for those patients not taking other antidepressants, I start the patients at 30 mg one each day for one week and then increase to 60 mg one each day. I then give patients 4-6 weeks at this dose to see how much benefit they achieve with this medication.Other benefits of this medication is that it is a weight neutral drug. This is appealing since other common neuropathic pain medications like elavil, neurontin, and pregabalin all cause weight gain. Unlike other antidepressants, it seems to cause a relatively small amount of sexual side effects.There has been controlled studies demonstrating benefit in fibromyalgia which is also beyond the scope of this article.The use of Cymbalta in depression is beyond the scope of this web site.